Let me Grow Your Traffic Today! TM Blast is a white hat Boston SEO service consulting agency located in Boston, Massachusetts. This operation is run by myself, Greg Kristan. I provide ethical and holistic search engine optimization consulting to businesses to improve their online presence in Google, Yahoo, and Bing. 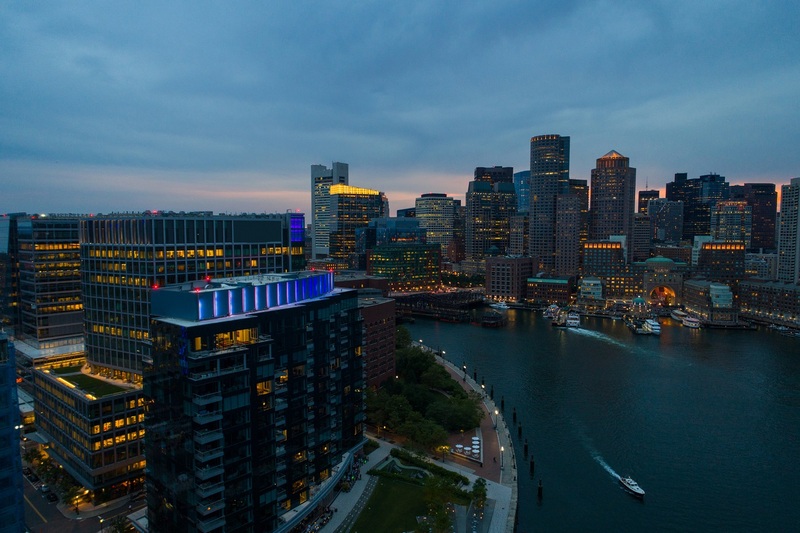 TM Blast offers the following Boston SEO Expert digital marketing services below. Did you know that organic listings result in 70% of Google clicks while paid ads get 15%? Proper organic search marketing will deliver positive results for a long time. The free traffic your website receives from Google and Bing will only grow as time goes by. Where paid search marketing (PPC) requires you to spend money for clicks, organic search will drive traffic to your site for free. As a note, you will see that the percentage does not come out to 100% because some results don’t yield a click. Does TM Blast Work with Clients Outside of Boston? The answer is yes! I’ve built out a strong niche for Boston SEO, but I work with clients outside of Massachusetts all the time. 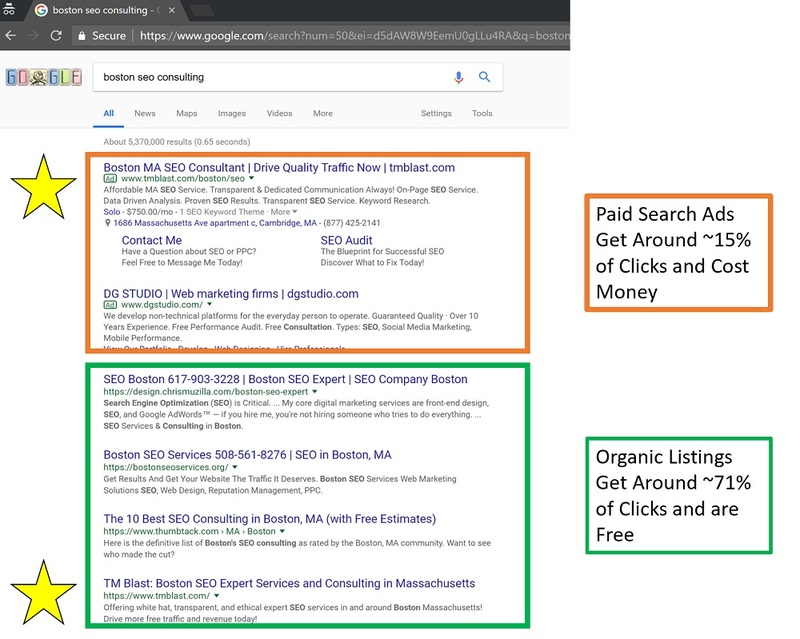 The difference I make for clients in Boston is that I will meet with you face to face, but otherwise there is no difference in SEO consultant strategy or service if you are not in Boston. When it comes to internet marketing project planning, TM Blast uses the same SEO expert services plan for all websites. It’s a 5 step process where everything repeats and improves upon the previous cycle. By making your site technically sufficient for Google and Bing to crawl, you will have the most success. Here is a visual on what the strategy looks like with the audit being the first step. You will notice that the process repeats which is key to a winning digital marketing strategy for the long term. 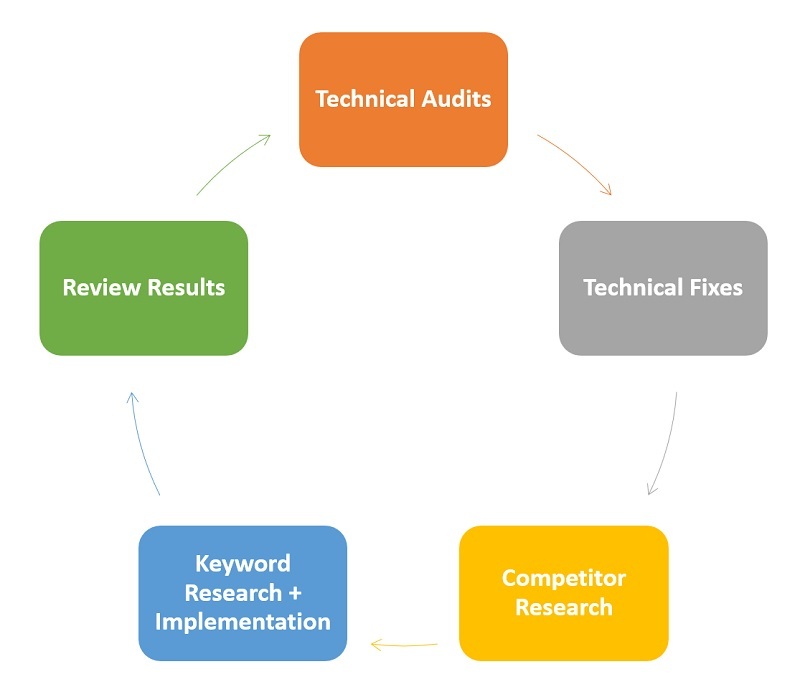 Keyword research is a critical element to successful organic SEO services. You have to keep working on something to keep your success in search marketing. TM Blast has over eight years of experience using this strategy effectively as a top SEO company in the market. TM Blast does not have an SEO Team as all work is done by myself. 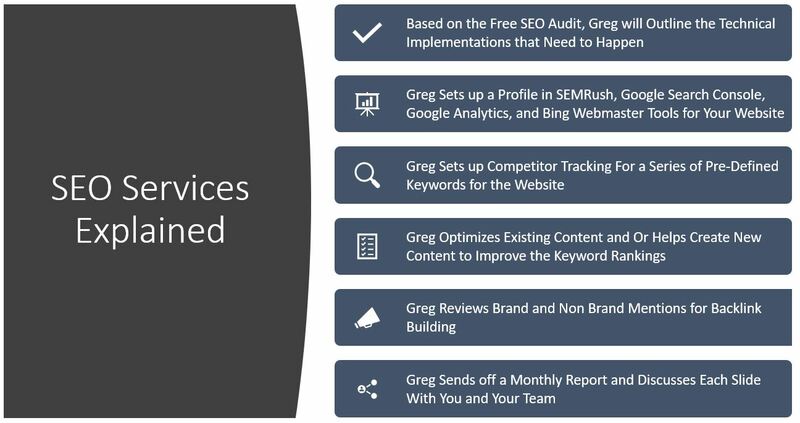 Here is a breakdown of the SEO Services I typically handle for optimizing your website. 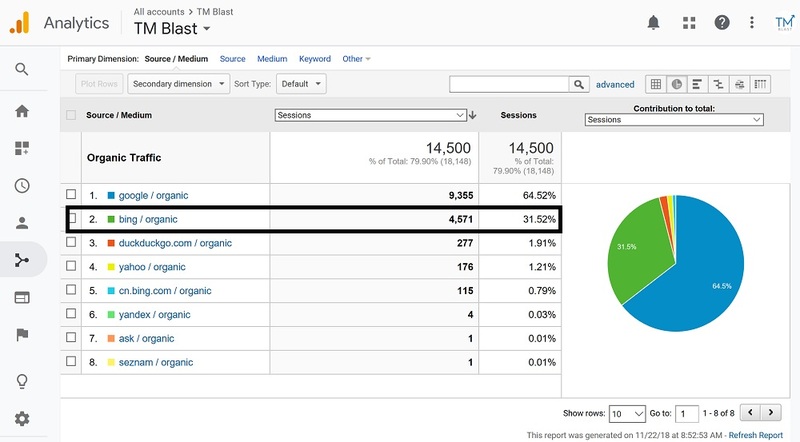 TM Blast uses different tools to deliver 1st-page keyword results for your website. The mix of tools includes ways to track keyword rankings, review site health, see how Google and Bing view your site, and much more. As a note, I may have new tools in my arsenal at any time, so these five tools give you an idea on what I’ll be using for your website. Content creation and page optimization is something my tools assist with as well. If you are looking for an SEO expert to be up to date with the latest tools, you’ve come to the right place. I also assist with content marketing and helping local businesses centralize their listings on Google, Bing, Yelp, and more. This picture from Google Analytics above represents the growth in organic traffic for a website I work on. SEO takes time to show real results, so I like to share this with potential clients. If you take the time to work on proper SEO, you will benefit from the results at a later time. In this video above, I share how I was able to move my client from page two of Google to page one in two months. The video is redacted, so I don’t share my client’s name or keyword to protect their brand. This was one of my fastest SEO case studies, but the formula and process is the same for all clients that I have. Each month, I create a custom report for you and your team to review. In this report, I share what I worked on, the website traffic, and my next steps so everyone is on the same page. Below is a redacted report I made for one of my clients so you can get a sense of what the report will look like for you. Top SEO agency services should focus on driving traffic from search engines outside of Google search. Bing is a search engine that does not get enough attention from most digital marketing firms. For TM Blast, Bing makes more than 30% of it’s organic traffic because I optimize my site for Bing. This SEO Expert uses a few specific tools for Bing SEO which include Bing Webmaster Tools and Bing Ads Intelligence which are available for everyone to use. You need relevant content, clear technical paths, and the right search terms to drive higher rankings in Bing. If you are wondering how much traffic Bing can drive to your website, you should check out their audience breakdown report. Ethical and white-hat SEO campaign practices is the goal of moving my clients to the first page in search engines. This optimization service does not participate in any shady link building, cloaking of content on the site, spamming forums, and so on. A strategic combination of technical SEO, on page, off page, competitor research, documentation, and tracking is how I operate. I do not have any secret sauce to improve your rankings. Instead, I focus on proper technical SEO and on page changes to give your site the best chance to rank in Google and Bing. Google SEO expert best practices, in a nutshell, are about providing an excellent user experience while giving their bot the ability to understand your content. Some other best SEO practices for Google and Bing include optimizing page titles, meta tags, h1 tag, images, footers, keywords, content, search engine rankings, web page SEO, and so much more. 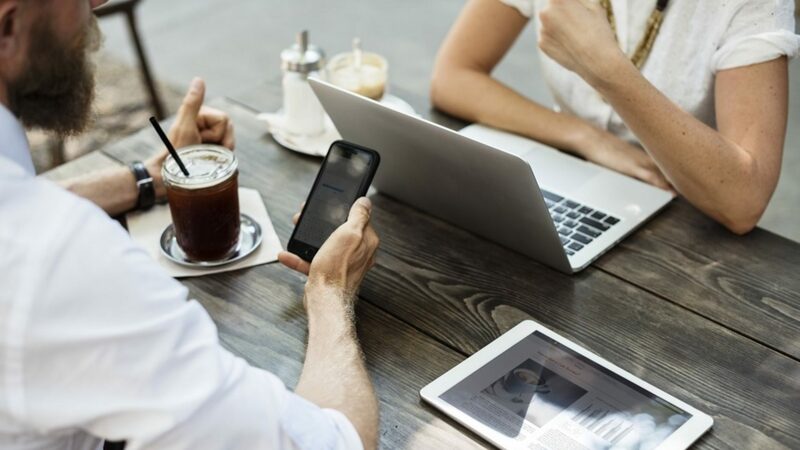 If you were looking to partner up with an organic SEO company to improve your online visibility, you’ve come to the right place. Start driving more free traffic from search engines like Google, Yahoo, Bing, and many more today to your website. Below are some of my most visited blog posts on my site. The range of blog topics on my site vary, but most of the time they follow SEO and PPC best practices. I don’t have any content that talks about social media management, but you will find reading material that discusses online marketing, WordPress tips, AdWords,web traffic, and local SEO. If you have an interest in being a potential customer, you can head over to the contact page to get in touch with me. If you’ve been looking to hire an SEO expert, you’ve come to the right place!